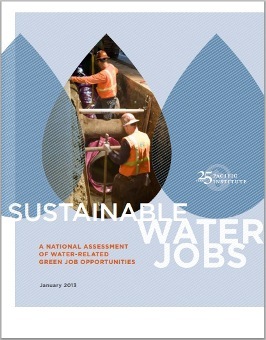 The Pacific Institute released a comprehensive study, Sustainable Water Jobs: A National Assessment of Water-Related Green Job Opportunities. The report finds that proactive investments increasing efficient water use and re-use will both address growing problems associated with drought, flooding, and contamination and create jobs in a wide range of professions. The study identifies 136 different kinds of jobs involved in implementing sustainable water strategies, from plumbers to landscapers, engineers to irrigation specialists. Thirty-seven of these job types are also projected to have high growth in the overall economy, with each projected to have more than 100,000 job openings across industries by 2020. The Pacific Institute identifies numerous sustainable water occupations that are accessible to workers without advanced degrees. Twenty-eight of the 37 occupations with 100,000 job openings by 2020 generally require on-the-job training, with some requiring previous experience and associate’s degrees or technical training, but not bachelor’s or graduate degrees. This translates to a more feasible pathway to employment for adults without formal education beyond high school. In addition, the study finds an investment of $1 million in alternative water supply projects yields 10-15 jobs; in stormwater management, 5-20 jobs; in urban conservation and efficiency, 12-22 jobs; in agricultural efficiency and quality, 14.6 jobs; in restoration and remediation, 10-72 jobs. Federal mandates that require water improvements and promote green strategies – such as the recent stormwater guidelines and green reserve programs in State Revolving Funds – work to meet anticipated water resource needs in ways that improve, rather than ignore, social equity, ecological conditions, and long-term sustainability of human-ecological systems. They also make labor demand more predictable and allow for more effective planning of green jobs programs.